"Hello, friends! 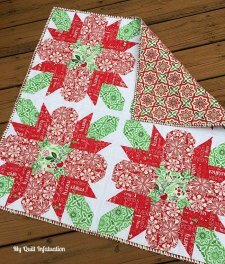 I'm Kelly, and I am so thrilled to kick off the Christmas in July project series! I'm a modern quilter, blogger, pattern designer, wife, mom, and former teacher. I wear lots of hats, as I know many of us do, and my blog home is My Quilt Infatuation. I'm so excited to share my Poinsettia Table Topper using Kate Spain's brand new Christmas collection, Jingle!. "I absolutely love Kate Spain fabric, and this line is no exception. The colors and prints are classic, but they feel very fresh and modern. They're clearly Christmas prints without being overly kitschy."